We’ve come a long way since the days of the Camera Obscura in the 6th century. Over the years we’ve seen the devices grow from giant machines with huge flash bulbs, to instant Polaroid film, all the way to the digital models on the market today. Still, a love of photography has abounded and many find it a soothing creative outlet. For professionals, finding a good deal on equipment is essential. With rising prices many rely on online shops like Samy’s Camera to stay under budget. To draw in traffic, they turned to the experts at OC Designs Online for a custom eBay Store Design. Now, they’re selling like never before. A main navigation bar at the very top of the storefront helps customers easily access key company information including frequently asked questions, return policies, ways to contact and physical store locations. Below, icons detailing free shipping, hassle free returns, international shipping options and a 100% satisfaction guarantee promise assure buyers they’re in the hands of the professionals. Our custom eBay Shop Designs also come standard with a search bar allowing your customers to filter out certain products or brands by typing keywords into the field. Store categories in the left sidebar vertically list grouped items including collectibles, cameras, accessories, film & darkroom and more, providing shoppers with organized options as they browse. Next, a warm welcome message acknowledges that the shop has been serving its loyal customers since 1976, offering its Southern California clientele “an impressive and up-to-date inventory”. In the midsection of this eBay Template, the store’s top five categories appear in a horizontal stretch of panels with easy access to an array of highly organized products. 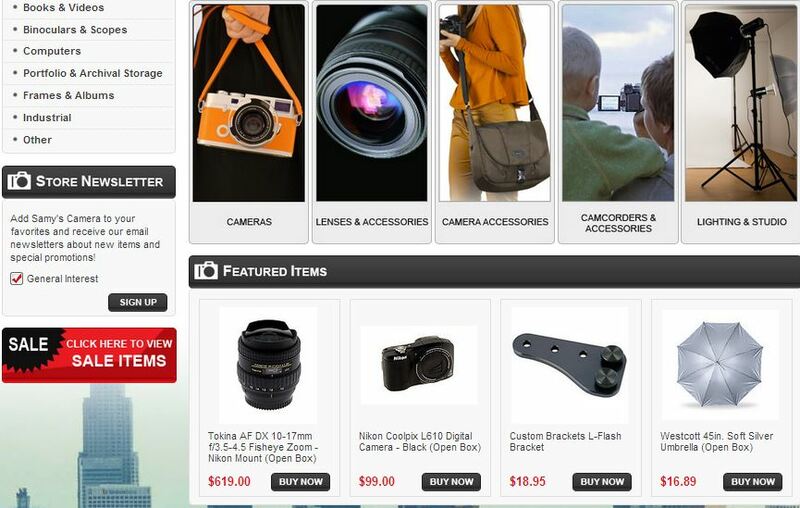 A section of ‘Featured Items’ enjoy the high traffic area below, offering customers deals on essentials such as a fisheye zoom, Nikon digital camera, L-Fish bracket and soft silver umbrella, all at a steal. The left sidebar comes to a close with an invitation to sign-up for the shop’s monthly newsletter. In doing so, Samy is able to keep its most avid collectors informed of any new inventory or special promotions. Let OC Designs Online show you what a carefully crafted eBay shop design can do to boost your site traffic! We are experts in the template designs guaranteed to grow your online business and we invite you to browse our ever-growing portfolio. Contact us about your eBay store design—it’s easy to request a quote! We invite you to like us on Facebook and don’t forget to follow us on Twitter!